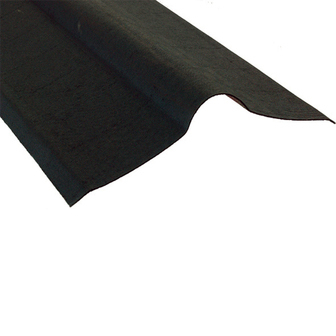 The Coroline Ridge is for use with Coroline Bitumen Sheet. It is flexible and easily adjusted to suit varying roof angles. Preformed end lap grooves make installation straight forward. Manufactured using the same material as Coroline sheets in the full range of complementary colours. Coroline sheets are covered by a 15 year waterproof guarantee. A replacement is provided free of charge if the product has failed to remain waterproof, in normal weather conditions within a 15 year period from the date of purchase. Coroline MUST be fixed and maintained in accordance with the manufacturer's instructions for the warranty to remain valid. Re-erections or consequential damage costs are not included.